Talking about marriage, ohh ohh. One of the most nerve-racking conversations in the world. For both, men and women. For women, because we fear to be rejected and eventually having to face the reality that our partner is not looking for the same thing as us. And for men, because they fear facing the topic altogether. The idea that they might have to give up their freedom and independence on a single day for the rest of their lives, scares most men to death. But what if you can talk marriage with your boyfriend without stressing him out and you breaking out in tears? Here are 10 Tips for talking about marriage with your boyfriend. Whoever thought giving someone, no matter if man or woman, an ultimatum was a smart idea, really needs to take a seat. First, it is very rude and demanding to tell a man that he has to make a decision right now about whether or not he wants to marry you. One thing you need to understand is that men DO NOT THINK ABOUT MARRIAGE as much as women do. While most women think, plan and breathe marriage from the day they receive their first Barbie and Ken set. Men simply don’t. If anything, they occasionally dream about playing football, basketball or soccer with their future son. That’s it! So, for you to demand a decision to a question he might never have asked himself right here and now, is straight up inconsiderate. Reason number 2 why setting an ultimatum is not a good idea, is because it’s an important decision that affects both your lives forever. And should not be rushed. Instead of setting an ultimatum, you should bring up the topic in a casual conversation and ask him to think about it. That way the next time you bring it up he is not caught off guard. Men are not stupid. They know that marriage and kids are on your mind…a lot. And if you are like me then you probably melt every time you see a baby in a stroller. It’s obvious! That’s why it is important you are truthful about it. If you have been dating for a while and believe it is time to talk about the next steps, don’t be scared to bring it up. Be honest about your desire for marriage and kids and how you see that in your (near) future. Again, don’t set an ultimatum, but let him know that you need him to think about it. And if it is important enough to you to end the relationship, be honest about that too. Show him that you value yourself a lot and want to honor a desire that God put inside of you for a reason. Remember that one of the key attributes of a healthy relationship is that both partners keep a sense of self-sufficiency, self-value and independence. And as a Single woman, your own joy and peace should always be your priority. One important tip for talking about marriage with your boyfriend is to encourage him to open up. 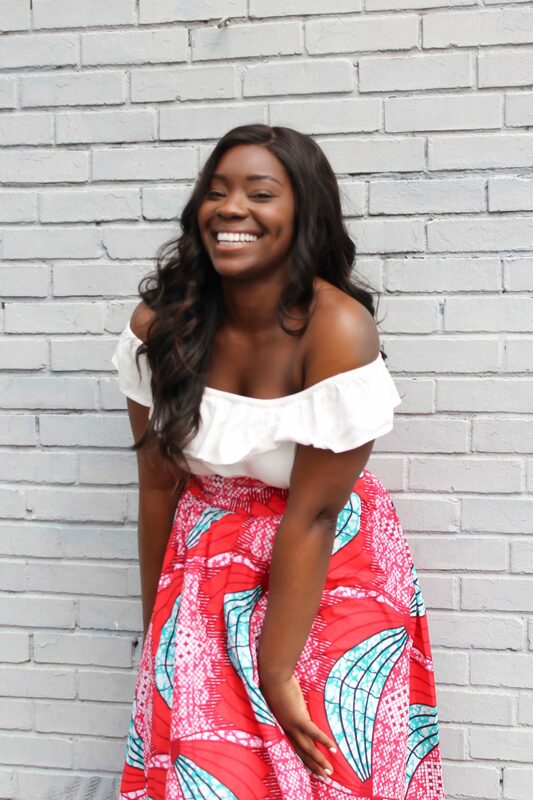 If you read any of my other blog posts before, then you know that I believe that the way to anybody’s heart is by building an environment that allows him to be vulnerable and truthful. While it might sound silly or immature to you, your boyfriend’s fears about marriage are very real and intense to him. Encourage him to share these with you and find out how you can eliminate them. He might be worried about divorce, because he has seen it in his immediate circle. If that is the case, discuss what he thinks are deal breakers in a relationship or marriage and would lead to divorce. By taking his thoughts and fears seriously and discussing them before hand, you make the topic less stressful to him. And once you understand what prevents him from taking this next big step, both of you can come up with a process and timeline that allow him to work through these fears. Okayyy. I strongly believe that couples should talk about their plans for the future, even before they get into a relationship. But if you never had the chance to do that, now is a great time. Find out what his plans are for the next 1, 3 or 5 year(s). Ask questions like: Where would you like to live? What age would be a good age to get married? At what age would you like to have children? Don’t just interrogate him but share your plans and vision for the future too. If his plans for the next 5 years totally deviate from yours than this might be a good indication that your relationship won’t last. I know this one is a scary one because you fear that he doesn’t see you in his future. But isn’t that the point of this conversation? Wouldn’t you want to know and more importantly move on if he doesn’t see you or marriage in his future? Find out rather earlier than later. Simple but effective: Tell him he is the one. All too often, couples talk about marriage like an abstract part of their lives without any outlines. You might have established the fact that both of you eventually might maybe want to get married, but never talked about the details. It is important that you outright share that you see him as your future husband and not some ideal man in your dream. Be bold and let him know why you believe his persona and characteristics match what you are looking for in a husband. Give him time to digest the information and encourage him to respond. Ideally, he will reflect on the conversation and confess the same to you. Make sure he actually sees you as his potential wife. Don’t wait to find out in an argument or after years of relationship that he likes/loves you but doesn’t really think you’re the one. It happens, and it hurts. The beauty about sharing your dreams for marriage is that it gives you room to share your expectations too. Let him know that you expect faithfulness, respect, love and all the other good stuff and that you will return the same to him. A marriage is a commitment that needs to be honored and cherished. In order to do that you will have to establish a set of rules that allow both of you to experience that. By letting him know in advance what you expect from marriage, you give him the chance to consider whether or not it is a commitment he wants to enter. Everything we speak and do should be led by God and I strongly believe that important conversations should always be consulted with God first. So, plan in a week or two of prayer and preferably fasting before the conversation. Seek God’s word to study marriage, biblical womanhood and love. Make sure that you are in it for the right reasons and not making an idol out of marriage. Also pray for your partner to have an open heart for the conversation. And for yourself to have an open heart for his answers. Prayer and fasting will allow you to enter the conversation with a peaceful heart. Remember when you were a teenager and decided it was time for your parents to increase your monthly allowance? Well just like teenagers tend to practice that conversation carefully considering every possible question, collecting important proof why they deserve it and preparing for different outcomes. You need to do the same now. Questions: Why now? Why Him? Why You? Why Marriage? Outcomes: What if he wants to wait? 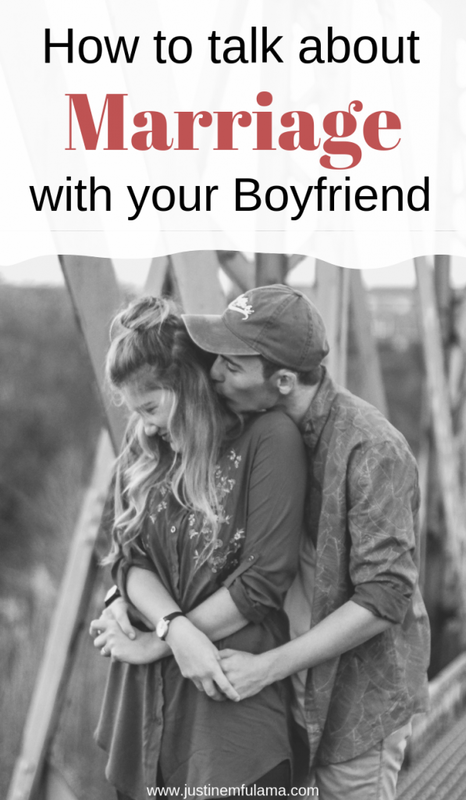 What if he doesn’t want you? What if he is stressed? Master this conversation by preparing well. The best way to avoid getting emotional, getting into an argument or making hasty decisions is by giving him time. Once you have voiced all the spirit led thoughts you wanted to share and he had the chance to receive it, end the conversation by deciding on a day you will resume the topic. Agree on a specific date that you will come back together and brainstorm the topic. That might include some of the points mentioned above or a heartfelt one on one. Haha one thing you might not know about me, is that I’m a cry baby!!! I get sobby and emotional at every movie and am the worst when I get into arguments. But one thing I have learned is to resist the feeling to cry when I’m having a grown conversation, especially in a relationship. Now here’s the thing. I don’t think crying is bad. Not at all, actually. It’s one of the beautiful things about being a woman and being in tune with your emotions. However, crying makes men uncomfortable. And being uncomfortable is something they try to avoid by all means. Meaning that, if you cry every time you have an honest conversation and it doesn’t turn out the way you want. His default behavior will be to avoid the (uncomfortable) situation altogether. And as mentioned above that is the exact opposite of what you want. You want him to feel comfortable enough to share his honest and vulnerable thoughts about the topic, without having to fear your reaction. So, whatever you do, try not to cry even if the outcome is not what you expected. 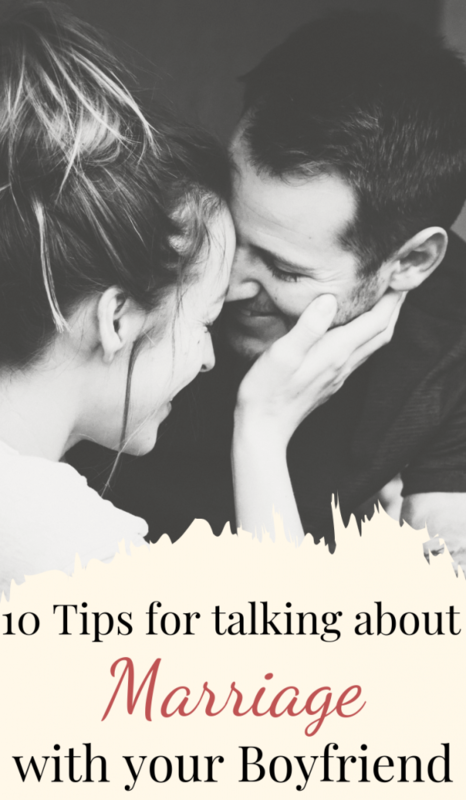 These 10 Tips for talking about marriage with your boyfriend will help you initiate the daunting conversation. Just wanted to thank you for sharing God’s wisdom through your blogs. I’m currently in a relationship where I need wisdom, guidance, courage to do what is right. Reading through your blogs, I found myself being more confident in pursuing God’s will in my relationship. THANK YOU! that’s amazing! Take heart and trust God. You will see he will give you the courage to choose the right thing.